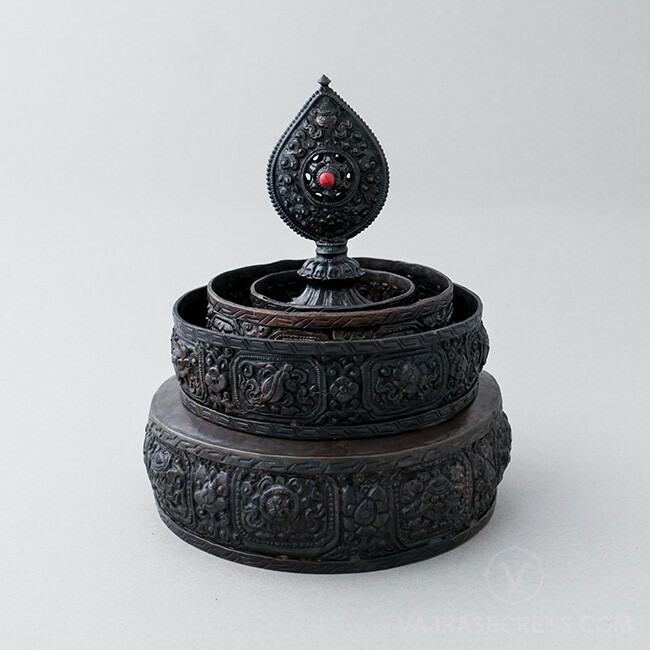 A traditional multi-tiered mandala offering set, hand-crafted from copper with an oxidised finish. Representing all that is beautiful and precious in the universe being offered up to the Buddhas, mandala offerings generate immense merits that will help propel you towards Enlightenment. The base and rings of this mandala set are carved with traditional motifs and symbols inspired by the Eight Auspicious Signs such as the eternal knot, the Dharma wheel and the victory banner. The crown jewel is adorned with a solitary turquoise stone on one side and a coral stone on the other.